Someone posted this beautiful memory of all the Miss Universe Canada winners on Instagram today. It was a trip down memory lane and it made me think of my journey and what Beauty means to me in my 40’s. I believe that real Beauty is about being YOU, unapologetically, imperfectly and authentically you. Always being true to yourself despite how it may look to others. It’s about radiating love and joy from the inside-out. It’s about seeing the world with beautiful eyes, and all people and experiences as divine teachers. It’s about embracing your femininity and still feeling powerful, strong and fierce. I feel honoured to have represented my country as Miss Canada, for me it is beyond physical beauty… it’s about confidence, self belief, trust and knowing that you were put on this earth to Shine. I am grateful I had the opportunity to rise up, stand up and show the world who I AM. In whatever endeavour you choose ladies don’t be afraid to claim the stage and shine, whether in a boardroom, in business or in front of an audience … BE YOU. Embracing all parts of ourselves: our intellect, our drive, our strength, our vulnerability is what makes us beautiful. Outwards standards of beauty presented in media and social media are fleeting, I know because I have experienced that industry first hand. The moment you alter who you are to fit into someone else’s vision of beauty is when you lose yourself. I have seen women undergo surgeries, unhealthy diets and desperately try to fit in to gain approval and self worth, and it hardly ever leads to that. Do what feels good to you and what’s healthy for you not for the opinions of others. I personally have been asked to get a nose job, implants and been criticized for parts of my genetics that I’m proud of, like my broad shoulders. I found all these things so superficial and knew the moment I would be given an opportunity to speak my truth and showcase my energy all else would be secondary, and that’s exactly what happened. And no I didn’t change one single thing about me. I owned the stage and reached heights in my career by being completely and authentically me. I believe true Beauty comes from your warmth and how you make someone feel. When you feel great about yourself, when you love yourself and allow the world to see you for you… you have the natural ability to make others feel that way and that is Beautiful. We have all met them, those people who radiate an energy that surpasses time, they age but are still magnetic. That charisma, that energy is a wholeness within themselves. The most beautiful people I have met told me they felt beautiful inside and loved themselves. Even the ones that don’t fit ‘conventional’ standards of beauty, the moment they believe in and own themselves… they become magnetic and you can’t help be attracted and drawn to them. In my humble opinion, the concept of beauty is really quiet simple… BE YOU tiful. Be you. In November of 2017 I decided I wanted to Sky Dive. I had an incredible year… a year I call a journey back to myself. I was on fire in terms of going after all my goals and desires. I followed my heart and my instincts which took me to Spain for an awesome conference full of entrepreneurs and ted talk speakers, to California for Burning Man and to Florida to experience Tony Robbins Date with Destiny. I felt transformed, alive and in love with life and myself. As I got clear on my vision for my life and the things I want to do and be, I had the sudden desire to sky dive in Dubai over the Palm. I put a photo of someone skydiving with the view of the Palm on my vision board in December, I had no clue when I would go to Dubai next. …but of course the universe works in mysterious ways. Two months later in February I felt like visiting Mumbai and Dubai, and within 24 hours I manifested a call from an old friend offering a work contract that would take me to both places! I took it. Within a week I was in Dubai. 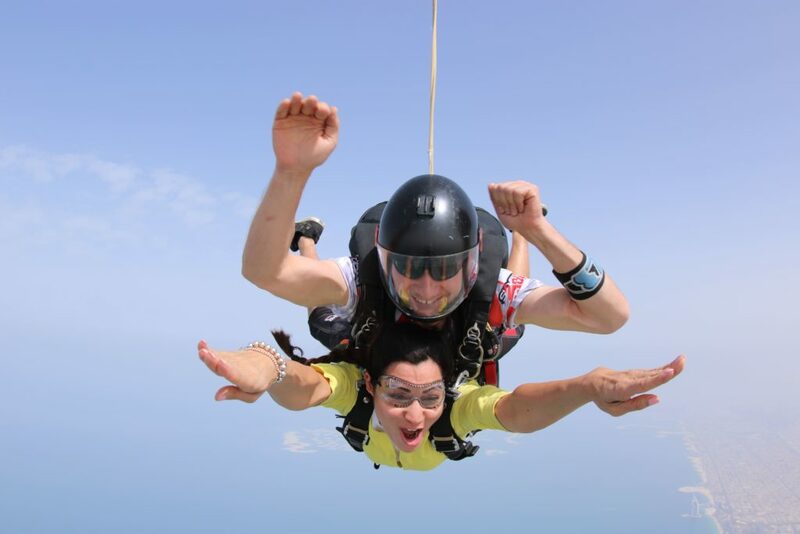 I tried to book Sky Dive Dubai 3 times before and during my trip but it was sold out. I thought it wasn’t meant to be… but at the last minute one person canceled, and the next morning I was in the sky jumping off a plane! It was my time, divine timing. I am proud to say that I experienced only a few minutes of nervousness and only felt fear the moment I looked at the earth from an open plane about to jump. It’s a surreal experience looking death into the face but having enough faith to leap anyway. I held my breath and jumped. In my mind I said it’s time to Let Go. Within 30 seconds my nerves turned into crazy, pure joy. It was exhilarating. Magnificent. I felt free, alive. It was fun and freeing. I felt like superwoman, unstoppable, powerful and like this was MY world. 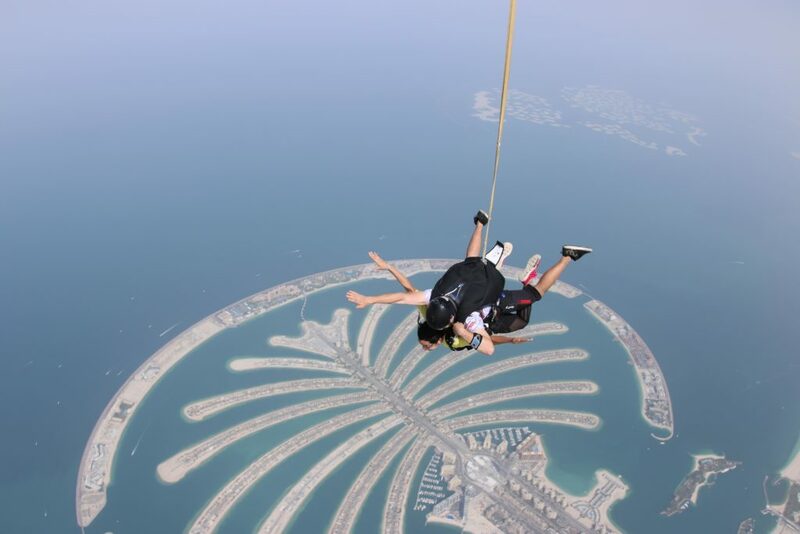 The parachute down was stunning, Dubai is beautiful. I had the view of the Palm (the exact photo on my vision board). When I landed I was blissed out and felt so calm and at peace. 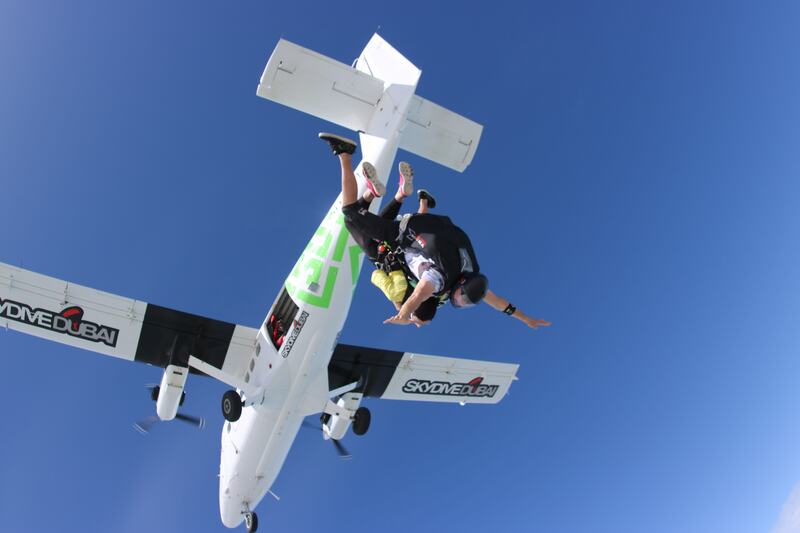 It’s a powerful thing to sky dive. I felt like if I could do this and face fear straight on, I can do anything. I feel fearless these days. Each time I look up at the sky I can’t believe I took the leap. It makes me realize how powerful we are and how incredible this world we live in is. If you get the chance I say DO IT! Be Fearless. Be You.